Eric Ewazen interview with Bruce Duffie . . . . .
For composers born near the mid-point of the 20th century, it's been quite a roller-coaster ride of styles, demands, and opportunities. From mandatory atonality to the explosion of minimalism to the current free-for-all, just what the creator puts onto the paper - and, therefore, into our collective ears - is more individualistic than ever before. All the old rules remain, yet none of those rules are mandated. New options arrive almost daily, but keeping up with them - to say nothing of using any or all of them - becomes a problem as the pile grows unceasingly. A fortunate few of those who commit notes to paper have found their way and are cutting a path which others want to follow. One of those is Eric Ewazen. His music is unabashedly tonal, yet sprinkled with touches and glimpses of many other styles. But whatever his output, the music gets played and recorded, which is part of the test of a prolific composer. It is also respected by his peers and by the musical establishment in general, as well as by forward-looking performers and seekers. In other words, this is a major talent that is finding its way. Having known a bit about him, I asked for a chance to speak with Ewazen whenever he visited Chicago, and the opportunity arose in March of 1998. Most of my encounters with musicians are fun and rewarding, but this one was particularly uproarious. There was much laughter for both of us, and his exuberance really showed in his enthusiastic responses and tendency to run many ideas and thoughts together. Needless to say, this made for a fast-paced audio track, and to transform it into something that can be read by the eyes is a tricky process. Most of the time, I have broken up the phrasing to make it read clearly without extraneous words which add to the aural experience, but clearly hinder a visual presentation. Re-checking it all, the ideas are there and nothing has been changed in terms of his thoughts or directions. Names which are links refer to my interviews elsewhere on my website. Here is much of what we said . . . . .
Bruce Duffie: Is there something supposedly strange about writing tonal music at the end of this millennium? Eric Ewazen: Well, I don't think so because there's been tonal music throughout the century, and great tonal music. It's just that this has been a century of so many different styles, and sometimes that makes it confusing for a composer, particularly when you're first starting out. When composers are in college, when they're first experiencing the wide world of 20th century styles and the complete variety that's there, what do you choose? There's always been wonderful tonal music around, whether it's Copland or Howard Hanson here in the States, or Vaughan Williams, or whatever. BD: But we seem to have lost it for such a long time, and now it's coming back. EE: Well, it is, that's very true. When I was a student in the early 1970s, by and large, most people, if you were going to major in composition, in composing, you had to very much be willing to write in an atonal style, an experimental style, whatever you want to call it. You would never be writing in a tonal style as a student in those days. Now you can. [Laughter] It's interesting, but I always kind of find it funny. I'm going to compare this... it's a little bit like when Picasso was doing a lot of the experimental works, teachers would always say, "But, of course, you know, he had his traditional style, he had the good traditional background, too, and he went through his Impressionistic period of Blue and Rose Periods, and this was a good foundation for all the abstraction." 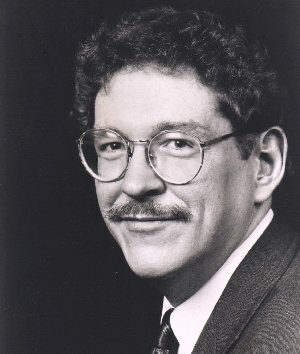 When I was a student in the '70s, in order to write all that contemporary atonal music, you had to say, "Oh, yes, but, I worked on my fugues, and I imitated Bach." Nowadays it's kind of fun, because when you're writing tonal music you get a chance to say, "Oh, yes, but I did my 12-tone music, and I did my theater pieces, and stuff." EE: Yes, right. Exactly. Now I'm ready to move on. BD: You mentioned that you have to find what kind of music you want to write. Do you find the music, or does the music find you? EE: Well, I like that idea of the music finding me. I had never thought of it quite like that before, because it is true that certain music speaks to you. You hear certain pieces where it's suddenly so breathtakingly beautiful, or you hear a chord progression that a certain composer used, or a piece of music that suddenly becomes so exciting and energetic, and you sort of want to imitate that style! You're learning a language that way. So when I compose I'm always listening to music by a lot of different composers. Composers of the past, composers around today, and world music. I'll listen to everything. I really try to keep an open mind about everything. Of course I was schooled, as I was saying, in quite a bit of atonality myself, and I just feel that I can pick and choose from the different languages, and then ultimately find my own expression, which happens to be very much a tonal style. But it's a tonal style where it can have moments of some of the other styles. I guess a lot of us are branded as being sort of eclectic composers, and when critics use that word they mean it as a put-down by saying you can't make up your mind what you want to do. But that's the style, that's the period we're living in, when all these styles are existing simultaneously. When you've learned so many, and at this point you want to just use a little bit of this or that, why not? Indeed, why not? BD: Should tonality, then, exist side by side with atonality? EE: Well, I've always said that I don't think that there is one and only one way to go. I think that would be wrong, because it seems to me there are just too many people committed to certain approaches, and are really sincere about it. I've heard some of the really great artists that will play a Schoenberg string quartet, and for them it's like playing Brahms. They really hear it with their ears that way. I come to composing also as a pianist, so I've played a lot of that, and it's interesting, because your ears can get really used to certain sonorities, and it doesn't feel unusual anymore. I do note that by and large, tonal music can really speak to audiences, and not that we just have to speak directly to an audience, because we never know who the audience is. We don't know what their experience is, we don't know what they're familiar with, we don't know if they're familiar enough to hear very abstract music and think it's Brahms, or whatever. But at the same time, face it, we want to communicate as a composer. I think every composer feels that way, even those that say, "Oh, well, we're just writing abstractly." I think everybody really wants to touch an audience. They want to have their own emotions out there, and we have to be honest that the music that has really come across to people has a lot of those elements. I remember Gunther Schuller speaking about music, and he described it as a stove with all these different burners. Some burners are on and some burners are turned off. If too many of the burners are turned off - the melody, the harmony, and the certain recognizable kind of rhythmic gestures - then it can indeed be so confusing to the listener that maybe that's not necessarily the way to go. You have to find your own voice and do what you like, but, boy, have I realized, both as a composer and as a teacher, that there's just no two people that go about it the same way. Even among tonal composers you have a lotta different approaches to why they're writing tonal music, and what their influences are. So it's just sort of fascinating. BD: Do you find that the atonal composers are embracing you as colleagues, or are they afraid of you? BD: Or do they even know you exist? EE: I live in New York City, and there's a lot of my friends and colleagues and we're all composers. I do note that we're all in different areas. I think among a lot of the people it's interesting. You get some people that are very open to it, and you really do get some people that absolutely think that as soon as you're writing tonal music they'll brand you for that, and feel that it's not as important. And yet it's so funny, because then sometimes other composers will be critical. It's like you don't know who to please. I don't feel antagonism or anything like that personally, but I am aware that there is certainly that schism there. BD: Then whom should you please? EE: I think number one, yourself. And again, because you're the one speaking, and the music that speaks to me, or the language that I can understand (if I've assimilated that) and really feel strongly about that, then I want to give that back to the audience, and I want to communicate that with my own musical language. I love the idea, again, of communicating with audiences, and I love the idea of communicating on first hearings. A lot of times people are saying, "Well, okay, when you get used to the music, and you listen to it over and over..." And then some people will also say, "Boy, you hear if something you can perceive right away at the very first time through, then it's a little bit simplistic." And people are put down by that. There was a review not too long ago in the New York Times, and they were talking about all these tonal composers that were up for Grammy awards, and they were really questioning that because they felt that it was looking backwards. But I just cannot understand that type of criticism, because all composers would do their homework throughout the centuries. They learn from copying out other previous composers' manuscripts, or studying, or writing themes based on other composers, and they'll write fugues, and they'll imitate how Bach wrote fugues, or they'll take a beautiful sonata-allegro form of Mozart and then imitate that. And that's fine! So I don't see why that should be a problem or an issue, but it is! I found that by and large it's the critics, more than fellow composers, that will put down tonal music. Performers certainly don't put it down. They're the ones who like it. I'm saying pleasing an audience is important, but I get a real kick out of the idea that performers will say to me they've had fun playing my music. I think that's great! Or you write for certain instruments where oh, boy, they love the idea of playing these melodies. Recently I've been writing a lot of brass music. Brass players have wonderful repertoire from the Renaissance and some Baroque, and then almost nothing during the Classical period. Certainly they weren't the main orchestral instrument to be written for. In Romantic music, a lot of these instruments don't have that. And then those same brass instruments get to the 20th century and they have a ton of stuff again. But a lot of times it is in these atonal styles, or very abstract styles. I will label my music, "neo-Romantic" and "neo-Impressionist," and I say that very proudly. I don't think that it's a problem with that. So that's it. I found, for example, those instrumentalists are looking for repertoire and they suddenly get so turned on to the idea that, "Wow, they have these forms and there are musical structures. They have these melody lines which are very singable," and that's the type of thing that I've been exploiting. So when I'm asked who am I trying to please, I say, "Number one, I have to know my language, and know the things that I want to communicate. I want to feel that I know the the chords that suddenly turn me on." And then I love the idea of working with performers. If they like your music, boy, will they bring it across. They'll bring you across to an audience. BD: They're first ones that have to understand what you're trying to convey, and if they understand it, then you've got more messengers. EE: That's it exactly. If I just can mention one word about what's interesting in terms of the atonal and abstract styles. I heard the 45th anniversary concert of the Juilliard String Quartet at the Juilliard Theater in October of 1991. They did all four of the Elliott Carter String Quartets that evening, and it was riveting. Of course, the one which brought down the house was the Third, which is so monumentally difficult. But it was amazing, because they're just so committed. I remember as a student I heard Jan DeGaetani always performing, and she would sing some of the really abstract stuff. It, she, would really come across to the audience wonderfully, so I guess it makes it sort of an exciting time to be a musician and a composer, with a multiplicity of styles. BD: Well, let me ask the real easy question: What is music? EE: [Laughs, again caught off guard] I do this thing called the Musical Encounter Series, where I prep students who are going to attend the open dress rehearsals for the New York Philharmonic. They're from the tri-state area in New York, and for many of them this will be the first time hearing the orchestra. So I will always ask them that very question, and they always seem confused. I've never been asked that question, and now I understand how they feel! For me, I'll think about Messiaen's taping all those birds, and wondering if that's music, and then I remember once doing an exercise: You know John Cage and his 4'33", where he has people close their eyes. I remember one time doing that with a group of people, and it was where you can hear the street noise from outside. It happened to be a rainy day, and everybody was just relaxing. Then from the distance, barely imperceptibly, a car was coming by, but you heard it because it was going through the water. It got louder and louder, and then it started disappearing into absolute silence. It was incredible! It was like the most perfect crescendo-decrescendo! That was sort of a musical experience. Now a lot of that, obviously, borders more on philosophy. At what point does life end and the artistic expression begin? I haven't dealt with purely sound effect-type things, although, I'm currently writing a piece called Mandala, which is based on beautiful Tibetan paintings. [Mandala for flute, clarinet, trumpet, violin and cello was completed in 1999.] I've incorporated some of the Asian modes and scales, and I've even got a couple of Tibetan singing bowls that do these beautiful drones that I'm including in the piece. It's going to be done in a museum in New York, and the piece is going to end with the performers walking into the audience with the bowls, and evaporating into silence. The silence will have to be a part of that. I learned that from George Crumb. Nine times out of ten, though, in my own music, for me, the whole idea of the line, the melody, is key. Sometimes I've composed pieces where the initial gesture came from a chord or a particular couple of chords, combinations that I really happened to like, and then I found a melody that fit it. But inevitably there is going to be some sense of a really genuine singing line there. But that's a very personal thing. For me, the music that I like will have that. BD: When you're writing down some of these ideas that you have, are you always controlling where that pencil goes, or do you find that the pencil sometimes leads your hand across the page? EE: I will control it. When the pencil's leading the hand it's simply when certain words or progressions that I know will work. Sometimes that will happen. However, I have to be careful, because that means I'm purely repeating myself. On the one hand, all composers have their signatures. They all have their progressions that you can recognize. But it can go further than that, and you see the honest-to-God same tunes appearing from one piece to another. This happens, of course, even among great composers, so that's going to happen. That's part of your language, but you've got to be careful that it doesn't happen too much. [Chuckles] You're always trying to find some new way of doing it. For example, in this Tibetan piece, I had never used those types of modes and scales before, and suddenly it was a fascinating new world for me. I incorporated that, and was using that. Jazz influence has been a big thing in my music recently. 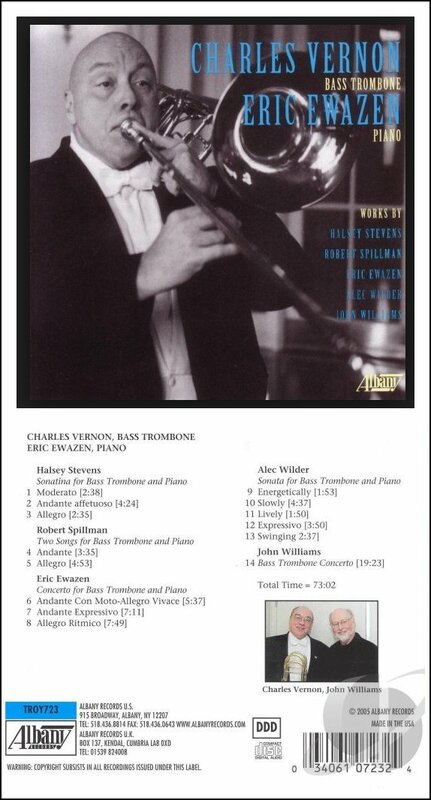 I have a Trombone Sonata, from 1993, that I'm going to be playing and recording here in Chicago, with Charlie Vernon of the Chicago Symphony [CD chown at left]. A student at the University of Indiana did his doctoral thesis, and a chapter was devoted to the jazz influences on that specific work. [Hale, Ted. "The Influence of Selected Stylistic Elements of Jazz on Seven 20th-Century Solo Trombone Pieces. D. Mus. dissertation. Bloomington: Indiana University, 1996.] I'll make studies of that, but I will very consciously try to be controlling what consequently is going to be resulting. I plan very carefully, wanting to know the emotions, but also the psychological progression of piece, because I always want to have the audience with me, and I want to manipulate them. BD: In a nice way, I hope. EE: Right, absolutely. [Both chuckle] But it's important to just know how I can suddenly get the excitement goin', or tug at the heartstrings, or create moments of peace and quiet repose, or whatever. But that's it, yeah. BD: Well, this leads me to one of my favorite balance questions. In your music, where is the balance between the art and the entertainment? EE: [Considers the question carefully] It's interesting to me. I may be misquoting him a little bit, but as I understand it, Stravinsky was insisting that his music he viewed very abstractly, that he wasn't there necessarily to communicate very specific emotions or feelings. They were abstract works. And yet, you listen to The Rite of Spring and I hear an awful lot of emotion in that music. So I would say that the entertaining aspects of the music, for me, are the art. I go into the museum and I see these beautiful works and I'm being entertained by that. I'm a big museum-goer, and seeing some of those things is just a knockout. You sit there in awe, and for me that's entertainment. So if the art happens consequently to entertain, I think that's great. I'm going to go back to the idea that you don't always know who's perceiving your art, who the audience is. So what entertains some people doesn't necessarily entertain others. For some, it'll be a big yawn. I know in my own perceptions, a lot of times in music, things change. Composers or pieces that I used not to like, I suddenly became so fond of, and then others might fall by the wayside a bit. But the entertainment value, if it's doing that, I think that's great. BD: Would you want your music to be loved and embraced by everybody? EE: Sure. [Laughter] Yes! If there's ways of doing that, I think that's fine. But once again, I'm gonna say I'm in the classical music field, so you're making a certain assumption already that the audience is willing to sit there x amount of minutes, and in this day and age of advanced technology, it is indeed exciting and wondrous, but it also makes for a lack of patience on the part of the listener. To sit there for an extended time listening to slow music may not necessarily appeal to people. BD: Would you be horrified to find your music in an elevator? EE: [Begins laughing hysterically, again clearly surprised by such a premise] No. No. I'm one of those people who feels anyplace I can get it done, that's great. Actually, it was really funny, because one of my pieces, the Ballade, Pastorale and Dance, for flute, horn, and piano, was recorded this past summer by the ABQ. But another time the piece was performed by a different group, and I heard their performance and it was just fine. Then the flute player told me that she was also a professional ice skater, and she used one of the movements as background for her skating. I thought that was wonderful! BD: Sure. Hope you got some royalties out of that. EE: [Laughter] You know, that's the thing. You have to watch out for that! BD: You get lots of commissions. How do you decide to accept a commission or turn it aside? EE: I like the idea of variety. I like the idea of being able to know the types of pieces that I feel ready to do, or that would suddenly intrigue me and get me started in a new area that I might not have done before. For example, I'm writing a piece for ten percussionists for a group at the University of Oklahoma. [This became The Palace of Nine Perfections, completed in 2000.] The idea absolutely intrigues me, because it's very different than writing sonatas for solo instruments and piano. I've written a lot of those, and I just needed some time away from the piano. So I'm going to percussion, of course, which includes marimbas and vibraphones which have keyboards, so I guess I still, in a way, do have that. BD: But it's a different sound. EE: Yeah, it is a very different sound, and I'll be very aware of wanting to write a familiar piece. For example, St. Luke's Chamber Ensemble, asked me to write something specific and I asked them if I could switch it around a little bit, which I did. I simply had wanted to focus on a piece for violin like a mini-concerto, violin accompanied by a string quintet. The work is called Concerto for Violin and String Orchestra, and it's a big piece, but it doesn't have to be an orchestra. It can also be done with just the string quintet. It was just the pure string texture which I hadn't done before. I'd had certain combinations of instruments, and right then I just wanted that pure sound. So I'll choose commissions along those lines. Also, I'd want to work with wonderful players who are enthusiastic. A lot of times commissions end up coming about through friendships and that's fun. It's just fascinating. So sometimes it's a bit of a fluke how you end up writing one piece. BD: You teach and you compose. Do you get enough time to compose? EE: Time is a big problem. I've just come over about a two-week period of not much more than about four hours sleep a night trying to finish a deadline, which I did finish. It's very difficult, because I love my teaching, and I will always be a teacher, no matter what is happening, because it's so inspiring. That's another place where I can get ideas or whatnot - through teaching and the work with students. I happen to be teaching music students, so that's great. The feedback you get from students, and how they perceive music, and what they like, and new pieces that they bring to show me that I might not have been familiar with. It's really corny, but it's so true, how you remain a student your whole life. BD: You don't steal from them, though? EE: [laughs] No, but once again I'm going to quote Stravinsky. I think he said something along the lines that amateurs are influenced, and professionals steal. I like that expression a lot. BD: [With mock seriousness] But please, call it "research." EE: Right, that's it, exactly. [Laughter] But in terms of the actual time, it takes an incredible amount of time to write. And it is true, those stories about working on one measure over and over, a couple of measures. It takes that much time. BD: Well, if you had no responsibilities, if you were financially free to do just the composing, would your music be any different, essentially? BD: There just might be more of it? EE: Well, I'm pretty prolific. I look at the composers of the past, and I wonder how they did it! [Chuckles] I honestly don't know, because your mind comes up with so many ideas at a time, and pieces evolve in a certain way. I think the only difference is I would simply have more sleep. [Laughter] That's about it. BD: Do you work on one piece at a time, or do you have several going? EE: Just one. There have been a couple times where I would have to interrupt writing one piece to work on another, and then go back to the first one, but that had to deal with the way deadlines worked out. But I can only work on one at a time. BD: If you're working on a piece and you get an idea that you know won't fit in that piece, do you stick in the drawer? BD: Is there ever a time when you sit there and look at the page, and go [pauses, as if at a loss for words] "Oh, my God... Nothin'!" BD: Take your own advice. BD: When you sit down to begin a piece do you know in advance the performance time? EE: More often than not, yes. Usually the commission will be very specific. Sometimes I'm given free rein, but I'll generally have a rough idea how long. Sometimes I get a little bit surprised. I remember one of my teachers, Milton Babbitt, was so careful about his music and the construction of his music. You would think that he would have it all calculated ahead. But I remember one time at the lesson, he was saying he'd started writing this clarinet piece and he couldn't believe it! It ended up suddenly being something like 17 or 18 minutes, and he had no idea it would end up being so long. [Milton Babbitt's My Ends Are My Beginnings for solo clarinet and bass clarinet, 1978; length: 16 minutes.] So once in a while that can happen, but the general idea of the scope of the piece is known right away. BD: I just wondered if what you're getting down on paper conforms to the preconceived idea of a certain amount of space, and time. EE: Yes, it will. I can't pretend that I can visualize the whole thing ahead of time, but sometimes, in the working out of the piece, the form comes after I've already come up with ideas. BD: You have just entered your 45th year. Are you at the point in your career that you want to be at this age? EE: [Thinks for a moment] Almost. [Laughter] I don't think any composer is satisfied. When I say that, I mean most composers are always looking for the next project. I am delighted with many aspects of my career. I'm delighted with being at Juilliard. I can't stress enough what a genuinely thrilling experience it is, because of the students, my colleagues, and friends, and the performers who are all there. I love the idea of writing the types of chamber music that I'm doing. And I've been very fortunate in having a couple groups that have been touring with my music, and have really helped introduce it now to audiences all over. Chief among those has been the American Brass Quintet. They've sort of embraced my music, and now on their concerts for the past ten years, they have included many of my pieces. BD: That's got to be a good feeling. EE: That's tremendous because they're at the absolute pinnacle of brass playing. So that was great. The only thing that I would like to have happen more is orchestral music, and this is starting to happen, which is good. I look at some composers such as Brahms, who was in his forties when he wrote his first symphony, so I think maybe I am on track. So it's not so bad. [Chuckles] But I do love writing orchestral music, although it's an incredible amount of time that's spent. Take this brass quintet concerto accompanied by wind ensemble. There's also going to be an orchestra version, but I calculated, it took me approaching 1,000 hours worth of work. That's incredible. You're talking about an incredible amount of time. But that's me. Not every composer works at that speed. There are some people where it does, indeed, go faster. But even though it takes a long time, my aspirations are to do more and more orchestral types of music. BD: I hope you get lots of opportunity. Thank you for coming to Chicago, and thank you for all the music so far. EE: Well, thank you. It's been just great talking with you. And thanks for your enthusiasm for new music. That's very exciting because, believe me, we need people who are there to support us. Eric Ewazen was born in 1954 in Cleveland, Ohio. Receiving a B.M. At the Eastman School of Music, and M.M. and D.M.A. degrees from The Juilliard School, his teachers include Milton Babbitt, Samuel Adler, Warren Benson, Joseph Schwantner and Gunther Schuller. 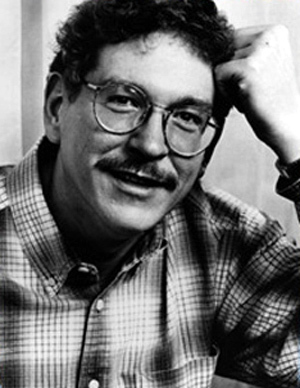 He is a recipient of numerous composition awards and prizes. His works have been commissioned and performed by many soloists, chamber ensembles and orchestras in the U.S. and overseas. He has been lecturer for the New York Philharmonic's Musical Encounters Series, Vice-President of the League of Composers--International Society of Contemporary Music, and Composer-In-Residence with the Orchestra of St. Luke's in New York City. He has been a faculty member at Juilliard since 1980. His works are recorded on Summit Records, d'Note Records, CRS Records, New World, Clique Track, Helicon, Hyperion, Cala, Albany and Emi Classics. Two of his solo CD's featuring his chamber music are available on Well-Tempered Productions. Three additional solo CD's, one featuring his orchestral music, another his music for low brass instruments, and a third, his music for string orchestra, are available on Albany Records. A sixth solo Cd of his music for percussion is available on Resonator Records. New World Records has released his concerto for brass quintet, "Shadowcatcher" with the American Brass Quintet and The Juilliard Wind Ensemble, conducted by Mark Gould of the Metropolitan Opera Orchestra. Individual works of Eric Ewazen have recently been released by the Ahn Trio, Julie Giacobassi of the San Francisco Symphony, Charles Vernon of the Chicago Symphony, Koichiro Yamamoto of the Metropolitan Opera Orchestra, Ronald Barron of the Boston Symphony, Doug Yeo of the Boston Symphony, Steve Witser of the Cleveland Orchestra, Joe Alessi and Philip Smith of the New York Philharmonic, the Horn Section of the New York Philharmonic, the Summit Brass Ensemble and the American Brass Quintet. His music is published by Southern Music Company, International Trombone Association Manuscript Press, Keyboard Publications, Manduca Music, Encore Music, Triplo Music, and Brass Ring Editions. For more information and current details about Eric Ewazen, contact his personal website . This conversation was recorded on March 21, 1998 in Chicago, and portions were broadcast on WNIB in 1999. This transcription was made in November, 2006, and was posted on this website at that time.